In a small prep bowl, dissolve the sugar into the rice vinegar, along with a pinch of salt. Add the shredded carrots, daikon and star anise, making sure they are all covered completely by the dressing to properly and evenly marinate. Now that this base pickle is complete, you can choose whether to add further condiments to the bowl: we recommend a mix of light soy sauce, lime juice and a dash of sesame oil, which will form your dressing later. Mix these into the matchsticked carrot and daikon, and then leave the bowl to one side for 15-30 minutes minimum. In a large bowl, pour boiling hot water over the vermicelli noodles and allow to stand for 5-6 minutes or until soft. Strain in a colander for a further 10 minutes, taking care to run your fingers through the noodles to separate the different strands, then spread the noodles on a tea towel to absorb any excess moisture. While the noodles drain, prepare your vegetables. Pick the coriander and mint leaves, roughly chopping the mint, before shredding approximately one-third of a head of iceberg lettuce, matchsticking the cucumber and washing your bean sprouts thoroughly. Now begin to assemble your salad. In a large mixing bowl, add the soaked vermicelli noodles along with the mint, coriander and pickled carrot and daikon, and spoon some of the marinating liquid over the bowl. Mix all together to ensure that the noodles are well and evenly dressed, before transferring this mixture to your serving bowl of choice. 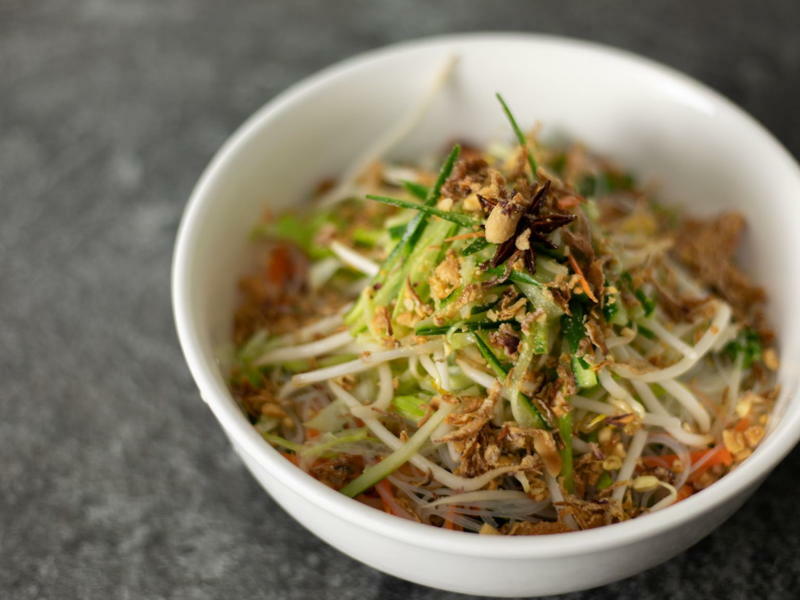 Finally, arrange the shredded iceberg lettuce, cucumber and washed bean sprouts over the noodles, before drizzling over more of the dressing, to taste. Garnish with crushed, salted peanuts and deep-fried shallots, if using, then serve - and enjoy!